Former academic Arthur Opp weighs 550 pounds and hasn’t left his rambling Brooklyn home in a decade. Twenty miles away, in Yonkers, seventeen-year-old Kel Keller navigates life as the poor kid in a rich school and pins his hopes on what seems like a promising baseball career—if he can untangle himself from his family drama. The link between this unlikely pair is Kel’s mother, Charlene, a former student of Arthur’s. After nearly two decades of silence, it is Charlene’s unexpected phone call to Arthur—a plea for help—that jostles them into action. 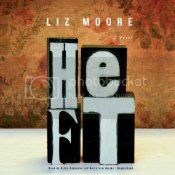 Heft is very well-written with great characterization. It is also unremittingly depressing for quite awhile. Both Arthur and Kel just have bad thing after bad thing happen to them. It seems they have so little in their lives that is good that it can be hard to take. Still, Moore has created compelling characters and difficult as it is to stay with them, it is also hard to turn away. Keith Szarabajka is an incredibly talented narrator, and he performes Arthur’s role magnificently, not to mention the amazing range of disparate voices he gives to those with whom Arthur came in contact. I was less enthused by Kirby Heyborne’s performance. He does a technically good job, but Szarabajka is a hard act to follow. In addition, it is a bit difficult to believe Heyborne as a teenager when he was born in 1952. He is able to affect a fairly youthful voice, but a teenager he is not. Perhaps other people aren’t bothered by this in audiobooks, but it drives me batty. I am much more able to accept a vaguely adult sounding child, but a maturely voiced teenager pulls me right out of the audiobook. I think I might have preferred this in print, so the sadness didn’t go straight into my ears, but Keith Szarabajka’s performance is worth a listen. Yeah, I’m guessing most of you actually already know the basic idea behind A Christmas Carol. I don’t know you guys, I mean, whoa, Dickens sure isn’t subtle about his MORAL. But on the other hand, even in the most fun adaptations, A Christmas Carol has a very obvious MORAL, so I was less bothered than I might otherwise have been, solely because I 100% expected it. That being said, I’m not sure I actually particularly enjoyed A Christmas Carol, I think it is much more entertaining with Muppets or animated Disney characters. Simon Prebble is great, he gives a solid performance, and I have no qualms about recommending him. 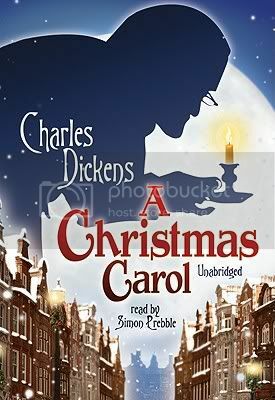 If you’re in the mood for A Christmas Carol, you could do much worse than this version, I think overall it is a bit easier to take in audio than in print. If you want to hear more of my thoughts about A Christmas Carol, they were the subject of the latest What’s Old is New Classics Rip. 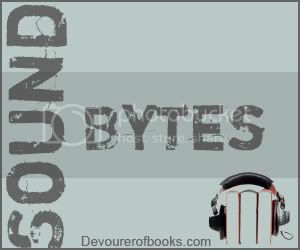 I will be on hiatus through the end of the year, please feel free to link up any audiobook reviews during that time. Thanks to Pam for creating the button.